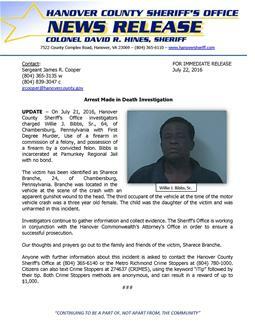 UPDATE – On July 21, 2016, Hanover County Sheriff’s Office investigators charged Willie J. Bibbs, Sr., 64, of Chambersburg, Pennsylvania with First Degree Murder, Use of a firearm in commission of a felony, and possession of a firearm by a convicted felon. Bibbs is incarcerated at Pamunkey Regional Jail with no bond. The victim has been identified as Sharece Branche, 24, of Chambersburg, Pennsylvania. Branche was located in the vehicle at the scene of the crash with an apparent gunshot wound to the head. The third occupant of the vehicle at the time of the motor vehicle crash was a three year old female. The child was the daughter of the victim and was unharmed in this incident. Investigators continue to gather information and collect evidence. The Sheriff’s Office is working in conjunction with the Hanover Commonwealth’s Attorney’s Office in order to ensure a successful prosecution. Our thoughts and prayers go out to the family and friends of the victim, Sharece Branche. HANOVER, Va. – On Thursday, July 21, 2016, at approximately 12:23 p.m., deputies responded to the 7000 block of Mechanicsville Turnpike for a motor vehicle crash. Once on scene deputies found three occupants inside the vehicle. As the deputies were checking for injuries they located a female in the front passenger seat deceased with obvious signs of trauma to the head. The driver and backseat passenger were not injured in the crash. The name of the victim, and occupants involved, is being withheld at this point pending notification of the family. Anyone with information about this incident is asked to contact the Hanover County Sheriff’s Office at (804) 365-6140 or the Metro Richmond Crime Stoppers at (804) 780-1000. Citizens can also text Crime Stoppers at 274637 (CRIMES), using the keyword “iTip” followed by their tip. Both Crime Stoppers methods are anonymous, and can result in a reward of up to $1,000.